August 3 General Assembly UN vote will no doubt be declared by the Western media as a resounding condemnation of Syria and a “universal” call for a “political transition” to install the US State Department’s stable of hand-picked and groomed administrative proxies. However, aside from CNN, BBC, and Qatari Al Jazeera’s ever-shrinking audiences, few on the planet will be convinced of these headlines. 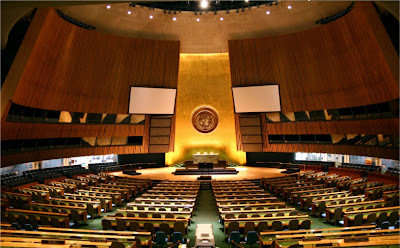 Image: The UN General Assembly has become an instrument of corporate-financier interests. Able to abuse the one-nation, one-vote structure of resolution votes, it can repeatedly pass “resolutions” despite nations representing over half the world’s population abstaining or voting against said resolutions. It should also be noted that Western representatives cast votes and produce “resolutions” without input or approval of their own populations – it is the very embodiment of the dysfunction brought about by overly centralized, unchecked supranational governance. 133 nations did indeed vote for the resolution tabled by the despotic absolute monarchs of Qatar and Saudi Arabia, both of whom are ironically conducting their own campaigns of brutal repression both at home, and in neighboring Bahrain – this not counting the overt weapons and militants they have sent into Syria to destabilize Syria in the first place. The hypocritical nature of the resolution’s sponsors is only outmatched by the feeble support it received. Should one actually analyze how many people were represented by the 133 nations that voted for the resolution, versus the 43 nations that did not support it, they would see a different story. 31 nations abstained, a muted protest to the resolution, with 12 nations voting firmly “no.” The combined population represented by these votes consists of the majority of humanity, and had Western representatives actually reflected with their vote their own population’s sentiments toward what is becoming yet another overt case of military aggression built on false pretenses – just as the notoriously reviled Iraq War was – the majority standing in opposition to this resolution would have been greater still. But the West’s UN representatives did not reflect the sentiments of their respective populations. Instead, they represented a minority sect of corporate-financiers whose vast ill-gotten fortunes and the unwarranted influence it grants them, has driven the political destabilization and violence sweeping the Arab World since the so-called “Arab Spring” began. Nations who didn’t support the resolution included China, Russia, Iran, Cuba, Pakistan, South Africa, India, Brazil, Bolivia, Venezuela, Iraq, North Korea, Belarus, Nicaragua, Myanmar, and Zimbabwe. It is an incomplete list that is already far too long, and already includes nearly half of the world’s population to be labeled as an “Axis of Evil.” It represents a shift from a Wall Street and London centric global hegemony, toward a balance of power amongst a multipolar world. 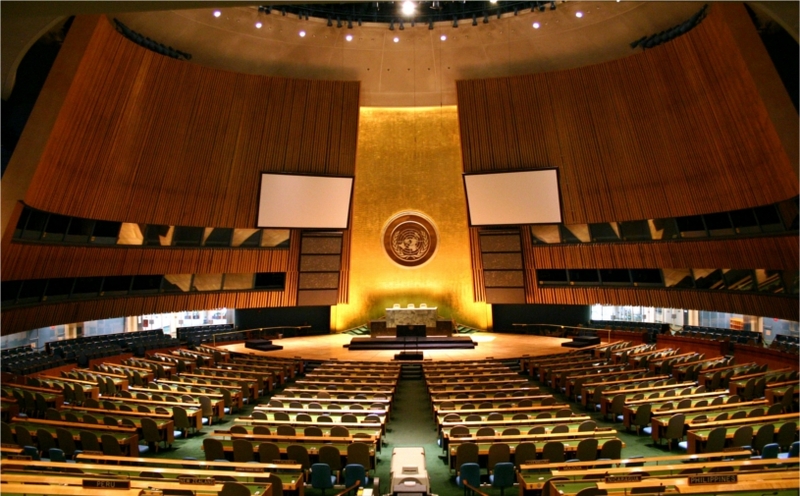 That such a resolution could be tabled by despotic regimes like Saudi Arabia and Qatar, and then subsequently passed, exposes the shortcomings of “global governance” and the so-called “international community.” What little sense the UN General Assembly’s “one nation, one vote” arrangement makes is further undermined by the fact that representatives of their respective nations rarely vote according to the will and aspirations of their own people in the first place. The UN has become a tool entirely of corporate-financier interests, articulated by UN representatives detached from their own populations, who have hijacked their collective voice and use it to ram through their own narrow, self-serving agendas. The UN, if it ever even had a realistic constructive role on Earth, has proven itself a menace – a variable ultimately undermining, not promoting world peace, justice, freedom, progress or any of the other pretenses its dominating members hide their true agendas behind. The UN has become a medium within which grand crimes against world peace can unfold, rather than a bulwark against them. The UN General Assembly vote signals yet another shift – one from feigned diplomacy by the West to achieve long planned hegemonic-driven regime change in Syria, to one of naked military aggression. Kofi Annan’s retreat from his self-mutilated peace plan follows the collapse of NATO’s “Operation Damascus Volcano” and the subsequent UN General Assembly vote. His retreat allows for the West to clear the table of “diplomatic options” leaving only military aggression. This was forewarned in March 2012’s “UN’s Kofi Annan: An Agent of Wall Street,” where Annan’s ties to the very corporate-financier interests driving Syria’s destabilization were exposed. The peace plan was an admitted gambit aimed at satisfying public expectations that “diplomacy” would be tried before a more aggressive military campaign was launched. With the court of global public opinion clearly turning against the machinations of Wall Street and London, now would be a good opportunity for a resolution to be leveled not against Syria, but against the regimes of Saudi Arabia and Qatar who openly admit to funneling weapons and even foreign fighters into Syria. Libya could also be added to that list, with the United States, France, and Britain also cited under the resolution for undermining world peace and pursing an agenda that demonstratively supports international terrorism. Surely the West could cobble together a majority based on its vast collection of neo-fiefdoms in the General Assembly, but it would yank the last bit of moral high-ground out from under them, forcing them, their policy makers, and the corporate-financier backers to proceed with their Hitlerian campaign in full light as the aggressors – as the villains.